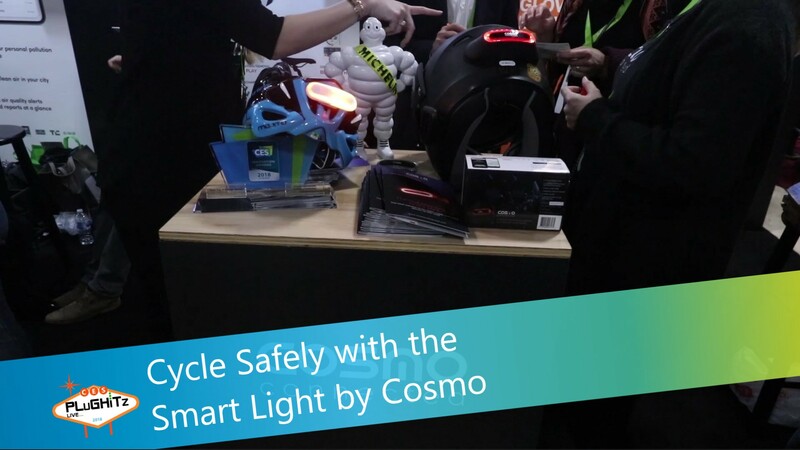 After the success of their smart helmet light for motorcyclists, Cosmo Connected are back at CES with a new version for bicyclists. For once the smart moniker is well deserved and it really could save lives. Todd goes for a ride with Emily. Winning three CES awards in 2018, the Cosmo team's smart helmet for cyclists builds on bike version. With investment from Michelin, the new helmet light not only shows when the cyclist is braking but also when they're going to turn. For braking, the light uses accelerometers to detect deceleration but for turns, it's more sophisticated. The smart light is pre-programmed with the cyclist's expected route and then uses GPS to anticipate upcoming turns, indicate either to the left or the right as appropriate. This is particularly useful for cyclists who have regular routes such as commutes. In the unfortunate event of an accident, the Cosmo smart light can automatically call for help via the rider's smartphone (Android / iOS) using Bluetooth. The new cycle light will be available in the summer for $59 - that's amazing value and I'll be getting one. As promised, here's last year's CES video for the motorbike light.